From his seminar on how to identify personality types, to presentation training, to one-on-one coaching sessions, by far have been the best thing that have ever happened to my career and refining my craft. 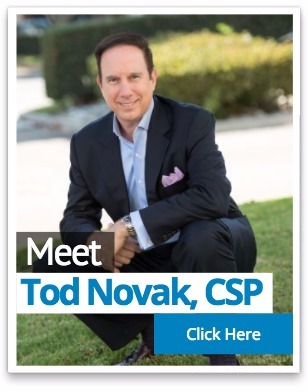 Tod truly loves the art of selling and cares for each every person he works with. Think about your salespeople in front of prospects. Are they communicating to each prospect how the prospect wants to receive information, or are they communicating to every prospect the same way? Without great presentation skills closing becomes very difficult and follow up is almost impossible since you did not make a great impression when you presented. What is your current closing ratio? The prospects that did not buy, how many buy after you follow up with them? With 39 years of sales experience, starting his first business at the age of 9, Tod knows the importance of what to say and when to say it. The secrets you learn from Tod’s Sales Presentation Training will allow you to deliver a substantial presentation and powerful close! If you are interested in hiring The Novak Group, please contact Joyce at 949-891-1423, or [email protected], or complete the following information, and we will respond within 24 hours.